Is total hip replacement right for me? Additionally, if your pain is negatively affecting your daily activities and keeping you awake at night, you may also be a candidate for total hip replacement surgery. You must have a preoperative (pre-op) history and physical with your primary care provider within 30 days of surgery. The results should be faxed to the facility where your surgery is scheduled, and you should bring a physical copy of the original form with you to surgery. The hospital or surgery center at which you’re having your surgery will typically have a joint replacement education class that you’ll need to attend. You will learn about what to expect before, during, and after surgery. If you choose to have your procedure at one of Summit’s surgery centers, you will benefit from one-on-one joint replacement education with personalized information in an intimate setting. Discontinue the use of vitamin E three weeks before surgery. Any dental procedures need to be completed at least one month in advance of your surgery. In dental procedures, bacteria can enter the bloodstream, causing infection and dramatically affecting your chances for a successful surgical outcome. Notify your specialist if you become ill with a cold, fever, congestion, etc., the week before surgery. We may need to reschedule your surgery. Do not take any acetaminophen (Tylenol), ibuprofen (Advil), or other pain medications after midnight the night before your surgery. If you are taking prescription blood thinners such as Coumadin (warfarin), Ticlid (ticlopidine), or Plavix (clopidogrel bisulfate), among others, please inform your specialist’s patient care coordinator. These medications will need to be stopped before the procedure, but only after you receive permission from the physician who is prescribing these medications. 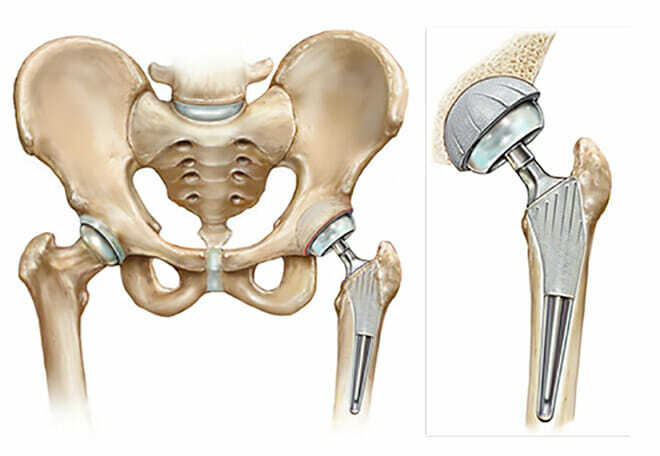 What can I expect after total hip replacement surgery? Total hip replacement surgeries can be performed either at a hospital or at the Vadnais Heights Surgery Center or Eagan Surgery Center. Initially, you will be placed in a recovery room for several hours so that we can monitor you closely as the anesthesia wears off. During this time, your family will be notified that the surgery is complete and that you are in recovery. After the effects of the anesthesia have worn off and you are medically stable, you will be moved to a hospital or Care Suites room, and your family will be able to visit you. Most joint replacement patients go home the same day if they have their procedures done at a surgery center. Some patients choose to stay in the Care Suites overnight. If a patient chooses to have the surgery in the hospital, the patient is generally admitted for one or two nights. During your stay, you will participate in physical therapy several times a day. Patients staying in Care Suites are also able to use our Secure Tracks specialty physical therapy device. Contact your specialist immediately if you develop a fever or chills, have pain that is not relieved by medication, have excessive unrelenting drainage or calf pain, or if you fall. Call 911 immediately if you experience any shortness of breath or develop chest pain. Before surgery, you and your physician will establish a plan for where you will be discharged after surgery and who will be caring for you. After you go home, you’ll come to our physical therapy facility twice a week for ongoing rehabilitation. After surgery, your treatment team will want to see you in clinic. At this appointment, you can expect to have any remaining staples removed, have X-rays taken, and receive instructions and guidelines for the next four to six weeks. Your specialist will provide you with physical therapy orders and can write a referral to a physical therapy clinic if you need it. It is important to have realistic expectations about your total hip replacement surgery. Although they are rare, there are potential complications with any surgery, and you are expected to have a reasonable understanding of the risks. Please refer to our preoperative informational handout for further information regarding potential complications and risks associated with surgery. Our goal at Summit Orthopedics is to assist you in this regard and help you have the best experience possible as you transition into this new phase of your life. Should you have any questions or concerns, please contact your specialist’s team. They are available to help you and address any questions or concerns that you may have.